1. Gellert Grindelwald (Harry Potter - J.K. Rowling) - Okay, so we do know a lot about him - but only through Dumbledore, and a dead Dumbledore at that! He's not just on the list because I love the dark, mysterious air of Dumbledore's shocking past - though that's the main reason! We first know about on the Chocolate Frog card in the first book, and at the end we know the whole story! Grindelwald is sort of scarily awesome - just like Voldemort. 3. 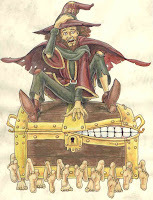 The Luggage (Discworld - Terry Pratchett) - The large chest, with thousands of tiny legs, that follows its owner wherever he goes, and swallows people that annoy it. What's not to like? No one really knows what happens to the people it 'eats up' and no one knows exactly how The Luggage came into existence. The Luggage is the most absurdly imaginative character ever! I love it!! 4. QT1 "Cutie" (I, Robot - Isaac Asimov) - The robot that begins to believe in a higher power! He's a highly advanced model with great intellectual capacity, using which, he convinces himself that it is impossible for mere humans to have created him. He begins to believe in a Master and proclaims himself as His prophet. Sound familiar? Before you know it, the new 'religion' spreads throughout the station and the robots refuse to take orders from the humans! 5. Fermin Romero de Torres (The Shadow of the Wind - Carlos Ruiz Zafon) - I loved this character! And specially his overwhelming sense of humour! A beggar, who is an ex-soldier with a terrifying past, who later works at Daniel's father's shop and goes on to become his great and loyal friend! He is kind of childish, but terribly funny and has the best lines!! 6. Professor McGonagall (Harry Potter - J.K. Rowling) - You know, it's really hard to choose favourites in Harry Potter. I don't really consider Hagrid, Sirius, Neville, Luna, Dobby as minor characters. I like Minerva McGonagall of all the professors, and she's a 'minor' character, because we don't really know much about her. But she is one of the 'good guys', she can turn into a cat, and Transfiguration is one of my favourite Hogwarts subjects!! 7. Dog - The Hellhound (Good Omens - Terry Pratchett & Neil Gaiman) - He is sent from hell, a ferocious beast, to be the young Antichrist's protector. On earth, however, he becomes a small terrier! His name is Dog and despite himself, he loves being and acting like a small dog - chasing rats and jumping around and yapping at cats. 8. Francis Adirubasamy (Life of Pi - Yann Martel) - Pi's "Mamaji", a close friend of the Patel family, he not only teaches Pi to swim but is also the one to tell the author the story! He is a world class swimmer and names Piscine "Pi" Patel after his favourite swimming pool in France. I loved his swimming lessons with Pi and his family, and the fact that Ravi calls him "Mr. Fish"! 10. Jeremiah de Saint-Amour (Love in the Time of Cholera - Gabriel García Márquez) - Not my favourite book, but I liked it at the start; where Jeremiah is a prominent character. While he is not important to the actual story, I love how we get insight into the book's main characters through him. I found it kind of fascinating! I almost included a Good Omens character and a Terry Pratchett character....We seem to have some of the same favorites in books! 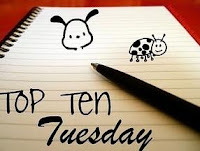 Please stop by my blog and take a look at my list of Top Ten Minor Characters. I'd love to see what you think. And I'd love to have you enter my May Giveaway for the new book Divergent. So many great characters in there. My favourite one you listed though is Dog! He was my favourite character in the entire book. So funny! Great list- I love that you added Dog. Good Omens was a great book. I agree with you on Grindelwald and McGonagall. Who knew a small blurb about Gridelwald would end up as a complete story of the man. There were so many great minor characters in the HP series it's hard to choose! The Hellhound, I'd forgotten all about him! Great choice. I love that you thought of him. I totally forgot. Great list, lots of fun. I definitely need to read these now! I only know the first one...how sad is that? haha. Thanks for the list! New follower! I wish we would have gotten to know a little more about Professor McGonagall's past. I never thought of Gellert Grindelwald in that way. That's a great description of him. And, I love Professor McGonagall too. I think out of all the Hogwarts subjects, Transfiguration, DADA, and Charms would be my favorite (maybe Potions if Snape wasn't the teacher). Love the Harry potter people! Great list! I also had the DEATH of Rats on my list. Cutie is definitely an amazing character. I was trying to think about characters from I, Robot that I really liked, but it's been so long since I've read it that I realized I had forgotten a lot of them. It's being added to the reread pile as we speak. @Jade - I know, there're are very few characters in HP that I don't like!! @Jenni Elyse - Charms is fun too, mostly because of Flitwick! I liked Potions when Slughorn was there!! @Gabrielread - I love that book! I liked the robots in most of the stories, but this one was particularly hilarious! @Booknympho - It makes sense that you wouldn't know, he's not there in the entire book! He's the guy that dies first!! Agree on all the Discworld and Harry potter characters. And Dog, of course.